Tomorrow is World Pharmacists Day, when pharmacists are encouraged to participate and celebrate the profession and promote the valuable role they play in bringing about great health for all. 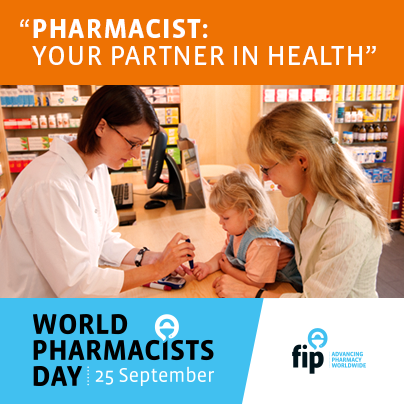 The International Pharmaceutical Federation (FIP) has chosen “Pharmacist: Your partner in health” as this year’s theme. At Pharmacist Support we’d like to find out what it is that you enjoy most about being a partner in health and we encourage you all to take part in our social media conversations using the hashtags #shareajoy and #worldpharmacistsday. Over the past 18 months, during our wellbeing sessions, we’ve asked students, pre-reg trainees and pharmacists about the joys of their job and we’ll be sharing some of those throughout the day. Please join in, download a speech bubble and share your joy! If on this celebratory day you’d like to support those in the profession facing difficult times and struggling to find their joy you can help by texting PHAR01 followed by a donation amount (Eg. £3) to70070. All donations greatly appreciated!